In his "Suggestive Music" series Agema translates the movements of musical and human body rhythms into colourful pictures. This is, as the artist puts it, a "xy-composition" including both the male and female side of the artist (x and y chromosomes). 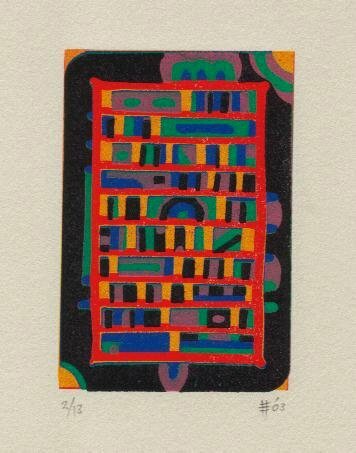 The inner rhythms of the artist at a specific moment are translated into this print. This is an original linocut hand printed by the artist in 6 different colours. The print is sold unframed for easy delivery. Paper size: 14*17 cm (5,4*6,7 inch) (not showed in full on the screen). The size of the edition is only 13 and the print is signed by the artist with his mark.